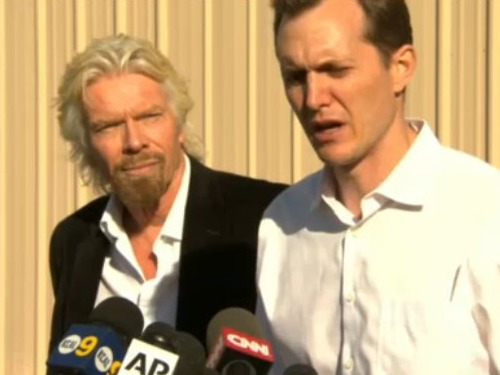 Screenshot/NBCRichard Branson, left, right before he spoke. Virgin founder Richard Branson told reporters Saturday that he planned to learn exactly what went wrong with the spacecraft that crashed Friday and hopefully still send civilians into space at some point. “This is a very tough time for all of us at Virgin Galactic, The Spaceship Company and Scaled Composites, and our thoughts remain with the families of the brave Scaled pilots, and all those affected by this tragedy. We are determined to find out what went wrong and are working with the authorities to get that information. It is too early for me to add any details of the investigation at this stage. We have always known that commercial space travel is an incredibly hard project. We have been undertaking a comprehensive testing program for many years and safety has always been our number one priority. This is the biggest test program ever carried out in commercial aviation history, precisely to ensure this never happens to the public. In testing the boundaries of human capabilities and technologies, we are standing on the shoulders of giants. Yesterday, we fell short. We will now comprehensively assess the results of the crash and are determined to learn from this and move forward together as a company. We have been touched by the overwhelming support coming from not just the space community but the world at large. If I could hug every single person who has sent messages of love, support and understanding over the past day, I would. The space community sticks together, and there have been touching messages of solidarity from NASA, X PRIZE, our customers, the media, the Virgin family and many, many thousand members of the public inspired by the vision of commercial space travel. We do understand the risks involved and we are not going to push on blindly — to do so would be an insult to all those affected by this tragedy. We are going to learn from what went wrong, discover how we can improve safety and performance, and then move forwards together.